Hamlet poster by J. & W. Beggarstaff, the Beggarstaff Brothers. This list includes the 22 known designs created by James Pryde and William Nicholson, when collaborating as ‘J. & W. Beggarstaff.’ Works created outside of this scope have been omitted. Both artists were more than ‘posterists’ — before, during and after their brief partnership, they both were painters and printmakers. In fact, Nicholslon went on to receive more recognition than Pryde with his vastly popular woodcut portraits (especially that of Queen Victoria). Pryde and Nicholson designed more than several works on spec. Although intended for publication, many of these speculative designs were unpublished, and original comprehensive sketches (‘comps’) have been lost or are missing. While there may be no extant samples, these missing works are nevertheless included in this list for completeness. Each work has been given an identifying number, chronologically, as it would have been created. Sources for dates and sizes of works are: originals, auction and exhibition catalogues, published works, and collection checklists. Click here for the working bibliography of this project. Sizes may vary from those listed, due to trimming and cropping of the various source works. Colors may also vary from those listed. On reprints and subsequent print runs for collectors (such as the Maitrés portfolios), color combinations were sometimes altered slightly. Variations have been noted where possible. Dimensions are given in width by height, and refer to final trim sizes, or outer dimensions, of pieces. The following abbreviations are used in this catalogue: p. (page), p.p. (pages), f.p. (facing page), o.p.f. (originally painted for), and f.a. (first appearance). Hamlet. Poster for W.S. Hardy Shakespeare Co., 1894. The School for Scandal. Poster for W.S. Hardy Shakespeare Co., 1894. Becket. Poster for W.S. Hardy Shakespeare Co., 1894. Nobody’s Washing Blue. Speculative poster design, 1894. Unsold. Nobody’s Candles. Speculative poster design, 1894. Unsold. Nobody’s Niggers. Speculative poster design, 1894. Unsold. Nobody’s Pianos. Speculative poster design, 1894. Unsold. Kassama Corn Flour. Poster for a Glasgow firm, 1894. Chinaman. Speculative poster design, 1895. Reproduced for collectors. The Hour Illustrated. Contents bill for The Hour magazine, 1895. Girl Reading. Poster design for Macmillan Publishers, 1895. Rejected. Don Quixote. Poster design for John Irving, 1895. Never produced, but reproduced for collectors. Roundhead. 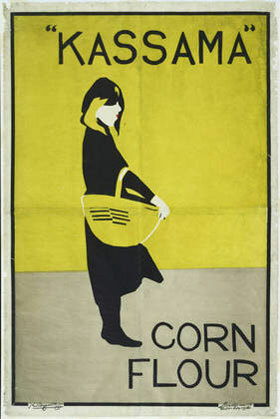 Speculative poster design, 1895. Unsold. Harper’s Magazine. Poster for Harper’s New Monthly Magazine, 1895. Coachman. Speculative poster design, 1895. Unsold. Cinderella. Poster for the Artistic Supply Company, 1895. Queen Victoria. Speculative poster design, 1895. Unsold. Girl and Screen. Speculative poster design, 1896. Unsold. Man and Map. Speculative poster design, 1896. Unsold. Rowntree’s Elect Cocoa. Poster for H.I. Rowntree & Co., 1896. The Quiver. Design for The Quiver poster competition, 1897. Unpublished. Robespierre. Poster design for Henry Irving, 1899. Unpublished. Copyright © 2008-2019 by Martin S. Lindsay. All rights reserved.